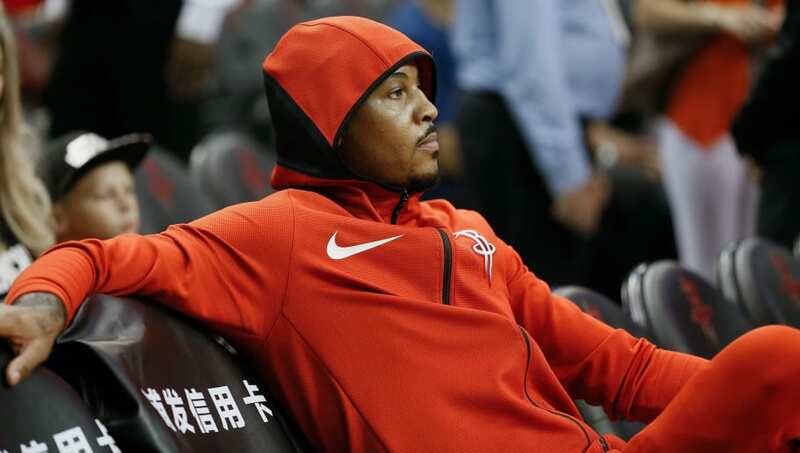 On Wednesday night, when the Houston Rockets played the New Orleans Pelicans on ESPN for the world to see, Carmelo Anthony will come off the bench for the first time in his Hall of Fame career.
" ... do anything for the team. We think that’s best today. It might not be best later – we don’t know – but having him is something that we didn’t have last year. Obviously, it’s really good." The late offseason addition of Melo was crucial to a team that lost a couple of capable forwards in Trevor Ariza and Luc Mbah a Moute, and while James Ennis was a nice addition from Detroit, he's not the proven scorer that Melo is. D'Antoni has decided to try out Ennis in the starting lineup for defensive purposes, and has even toyed with the idea of having Eric Gordon start in a three-guard lineup with Chris Paul and James Harden. In these quotes, D'Antoni leaves the door open for Melo starting in the future. The ​Rockets will first have to see consistency in shooting (i.e. an improvement on the 36 percent from three he put up last year) and play barely enough defense simply to be playable in crunch time. Melo and the Rockets fell short in their first test today, ​falling to the Pelicans 131-112. But this long journey was quite a ways to go before anyone ought to panic.